Preprinted placemat set features bold lines and large coloring spaces. Brief, informative poems add to their appeal. Color with crayons (set of 4 included), markers or coloring pencils (both sold separately). May be laminated for long life. Sets include 2 each of 5 different designs. Preprinted place mat set features bold lines and large coloring spaces to increase success and raise self-esteem. Brief, informative poems add to their appeal! 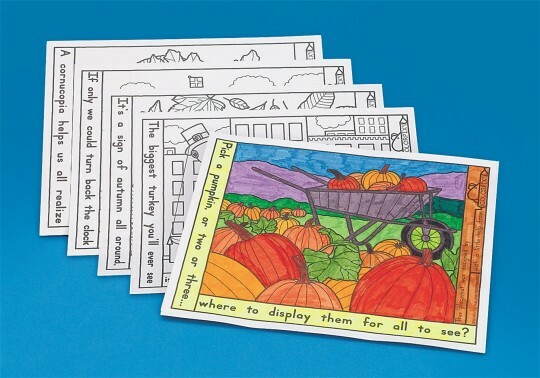 Color with crayons (set of 4 included), markers or coloring pencils (both sold separately). May be laminated for long life. Sets include 2 each of 5 different designs. 11" x 14". See above. The children really enjoyed coloring these place mats. I laminated them so they could keep them for a long time. Great for an out of the box instant use project. I used this product as an easy art project for senior citizens. I laminated the finished work.